Four years after initially funding the construction of the Tourari School, near Timbuktu, Mali, Eileen Rogers and Debbie Hill, two Arizona friends, launch campaign to rebuild the school badly damaged by Islamic militants, appealing to public to support their campaign. 2012 and 2013 have been devastating years for education in Mali. Islamic militants linked to Al Qaeda closed schools and destroyed school buildings, eliminating the chance for the children of Mali to gain literacy and the opportunity to build lives that can reach beyond the country’s pervasive poverty. Since then, Caravan to Class – a San Francisco-based organization dedicated to helping the children of Mali reach literacy – has worked diligently to rebuild and reopen schools in villages near Timbuktu, Mali. Now, two Arizona friends, Eileen Rogers and Debbie Hill – working with Caravan to Class – have launched their own fundraising campaign to focus on rebuilding a school in the village of Tourari, outside Timbuktu. During the worst of the conflict, the school was used by militants to store weapons and munitions and was severely damaged by the fighting. Rogers’ and Hill’s campaign, organized through Caravan to Class using Global Giving, the leading online charitable giving site, will help pay for re-construction of the Tourari school. A new, solid and welcoming concrete structure will replace the old, badly damaged mud brick building which had required major annual repairs. This is a familiar effort for Hill and Rogers. In 2009, they organized over 300 donors and friends and worked through TurtleWill, an Arizona-based 501 c(3), to raise the funds that built the Tourari school. Rogers had visited there as part of a medical mission organized by Turtlewill. Although it was difficult to witness the destruction of a project that was so dear to them, the experience increased their resolve to begin this new effort. "The response of our friends and family, who supported the original construction of the school, has been very strong," said Hill. 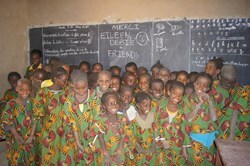 Rogers added, "We hope we will inspire new donors to help bring education to this deserving group of children by donating to our Global Giving campaign http://www.globalgiving.org/projects/help-children-in-war-torn-timbuktu-go-to-school/ through Caravan to Class." Since the French liberation of Timbuktu and Northern Mali, Caravan to Class, working with the Timbuktu Ministry of Education, (Centre d’Animation Pedagogique) and the UN World Food Program, has already opened four schools in its network, and is scheduled to open four more schools next month. Caravan to Class is a 501c3 all-volunteer charitable organization in the United States and is one of the few organizations actively supporting education in Northern Mali. With two full-time staff on the ground in Timbuktu, it supports a network of eight schools and more than 1,000 children with the focused mission to help children achieve literacy before the end of 6th grade. "We feel so privileged, after the traumatic events of last year, to be once again helping Tuareg children in Timbuktu achieve their dreams of education," says Barry Hoffner, Founder and Executive Director of Caravan to Class. "There is simply no better feeling than seeing, in person, a young Tuareg girl reciting the French alphabet, knowing that she will be the first in her generation to become literate," Hoffner adds.